Why PreventIV Measures? – PreventIV Measures – Sagent Pharmaceuticals, Inc.
How can PreventIV Measures help? Home \ Why \ Why PreventIV Measures? PreventIV MeasuresTM Packaging and Labeling? generic injectable products from any one supplier tended to look very much alike—similar labels with the drug strength in a small font and little or no differentiation of any kind to indicate different strengths or even different drugs. Sometimes, the most prominent information on the label was the company name, causing the drug name and strength to be even smaller. and MEDMARX (an adverse drug event database). As a startup generic injectables company, we realized that we could be part of the solution. So from the launch of our first product, ADENOSINE Injection, USP in 2007, we have made PreventIV Measures Packaging and Labeling a major part of our product offering. 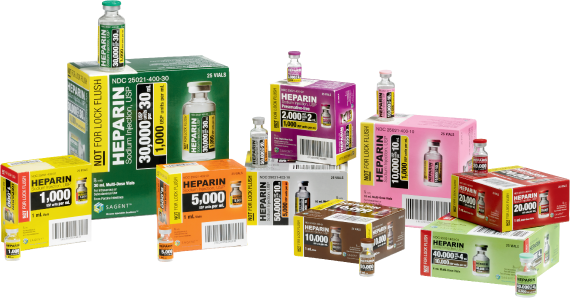 PreventIV Measures Packaging and Labeling is featured on every SAGENT product, including our award-winning HEPARIN family. Our commitment to patient safety also extends to our premix bag products. On each one, the drug name and strength are printed on the front and back of the overwrap, so the product can be identified immediately and accurately, no matter how it’s stored. Every product we have manufactured has featured PreventIV Measures Packaging and Labeling. Every product has a unique design and every strength has a distinctive color. Every product name and strength is prominent and easy to read. It’s our way of helping make accurate medication selection an easy and obvious choice. It was our commitment in 2007 and it remains our commitment today. 2 FDA Medication Error Reports. March 5, 2009. 3 Makary MA, Daniel M. Medical error—the third leading cause of death in the US. BMJ 2016;353:i2139. The SAGENT logo, SAGENT, SAGENT Pharmaceuticals and Discover Injectables Excellence are registered trademarks of Sagent Pharmaceuticals, Inc.